The first new BlackBerry with a physical QWERTY keyboard released in two years hit store shelves in Canada today, in the same week that BlackBerry CEO Thorsten Heins predicted selling “10s of millions” of the smartphone. Major carriers were readying retail stores for customers to get their thumbs on the Q10, just days after its world debut in the UK. CBC reported that Toronto-area stores would be the priority to receive unit shipments, with the phone being available in the rest of Canada later this week. But it also reported that Telus Corp. said phones were being shipped to stores across the country. The LTE-enabled smartphone that runs on BlackBerry 10 will be shipped in thousands of units to Rogers Wireless stores, according to Phil Hartling, senior vice-president of consumer marketing at Rogers Communications Inc. “We’ve been very generous in order quantity with BlackBerry because we believe the device is going to sell,” he says. White BlackBerry Q10. Image courtesy of Rogers. Rogers will be the only carrier offering the Q10 in white. Its been taking reservations on the phone from its current customers for months, and those units will be shipped today, Hartling says. Those coming into stores will be able to learn about using the new OS from a certified BlackBerry expert. Rogers’ Q10 device will come pre-loaded with some of its mobile services such as Smart Home Monitoring, Rogers Anyplace TV, and the Sportsnet app. Carriers have been working with BlackBerry for many quarters in anticipation of the smartphones return to the market with a modern platform that competes with Apple’s iOS and Google’s Android. Initial reaction has been promising, with BlackBerry saying 1 million units of its debut Z10 smartphone had sold ahead of its last quarterly earnings report. Telus Mobility also offers training on BlackBerry 10 through its Telus Learning Centre and a one-on-one session with a BlackBerry expert. 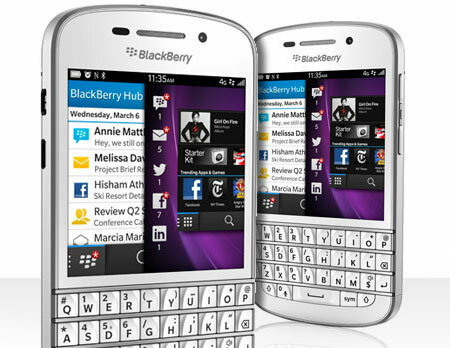 Major carriers are offering the Q10 for $199 on a three-year contract or for $650 to $700 off contract.